Toe: My normal toe up: cast on 12 stitches and increase to 64 sts. I changed from my normal left and right leaning increases to left and right leaning (nearly) invisible increases. I like this because it is faster than e-wrapping stitches on the needle or pick up and twist the bar below — at least for me. Heel: Fish Lips Kiss Heel worked over 32 sts, decreased to 12 sts unworked. The kissy fish heel (my words) look a bit funny off the foot, but I like how it looks on the foot — no short row gaps, no lines of stitches. Just a smooth transition — you can follow the line of stockinette around the bend. The pucker is created by the row of regular stockinette stitch before turning the heel. Cuff: Approximately 5″ from floor (1.5″ above my anklet bone). 3×1 rib at approx 1.5″ from cast off for 1″; 1×1 rib for 0.5″; tubular bind off. I gave myself a bit over 4x the circumference of the cuff and used every bit of it with just a few inches for weaving the end in. The bind off may be a bit too loose but I wanted to make sure it will be stretchy. I’m sure I’ll figure out the correct tension with practice. I really like how it looks and feels. I’m not happy with the jog between the first and last stitch even though I wove through the last stitch. I’ll need to play with it a bit more. Despite these issues, all solvable with practice, I think this bind off is a keeper! * This red is really difficult to photograph. It is a true scarlet red. ** Yes, I’m playing with my sock recipe again. It’s good to shake things up every once and a while and question why you do things you do. 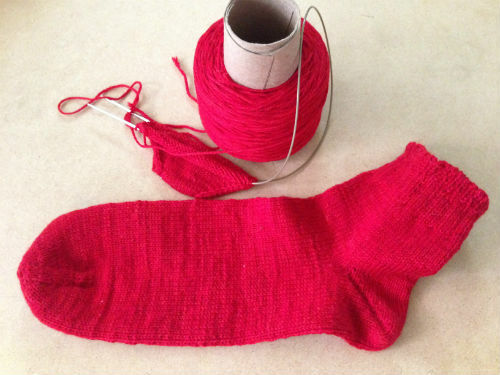 I am just finishing my first toe up sock using directions from Knit Picks. Although the directions are for knitting two socks at once, I am doing a trial run by knitting just one. So far, so good. I started with a 14 st cast on, but I think I will use 12 next time. 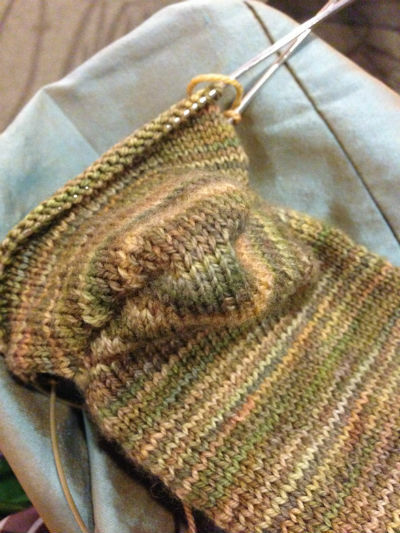 The heel turn worked out fine and I am now doing the leg using 2/2 ribbing on 60 sts. Always happy to have new ideas. Would love to see your socks the next time I see you.